Returning to golf after a year’s break Steve Jones has quickly found himself leading the BMW ISPS HANDA New Zealand Open. Playing at The Hills, Steve Jones battled through the tough morning conditions yesterday to shoot 6-under 66 despite opening with back-to-back bogeys. Having spent 2015 at home caring for his family, while his wife received treatment for a brain tumour, Jones was happy to see his result close that period in his life. Sitting a shot further back from Jones on 5-under the card is 25-year-old Callan O’Reilly. Coming into the tournament confident in his game, O’Reilly was happy to post a good number around The Hills in the opening round. 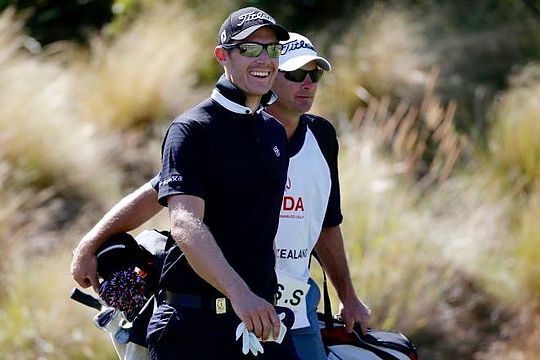 The BMW ISPS HANDA New Zealand Open has been dominated by young New South Welshman in recent times. In an interesting coincidence all three of the past champions, Jake Higginbottom (2012), Dimitrios Papadatos (2015) and Jordan Zunic all played alongside O’Reilly as amateurs in the 2012 NSW state team. Shooting an opening round of 4-under 68 at Millbrook, the best result to come from that course, was New Zealand Rookie Pro Josh Munn. This is just Munn’s second tournament on the PGA Tour of Australasia after he made his debut last week at the Holden NZ PGA Championship and he is pleased with his transition so far. He is joined tied third by season Australian Professional Matthew Millar who posted 4-under 68 late in the day at The Hills. Rounding out the top-5 on 3-under the card are Shunsuke Sonoda, Darren Beck, Rory Bourke, Hideto Tanihara and Anthony Brown. A further 12 players are all tied 10th after the first round on 2-under the card. In the pro-am component of the tournament, which is being played for a bonus NZ$50,000, Steve Jones and his amateur partner Stuart Munro lead at 13-under the card.